Background: The aim of the present study was to determine if there is a benefit for the use of Ultrasound Bone Growth Stimulators for osteoarthritis of the knee. There is evidence that osteoarthritis of the knee is primarily a disease of subchondral bone and the joint changes are secondary. Since subchondral bone in osteoarthritis contains fibrous tissue and bone growth stimulators function to change the fibrous tissue in the callus of fracture non-union into normal bone, there exists the possibility for a treatment of osteoarthritis of the knee with bone growth stimulators. Methods and Findings: Ten patients with confirmed osteoarthritis of the knee were included in this pilot study. Each patient’s pain and quality of life were assessed on three independent scales before and after treatment with non-invasive bone growth stimulators. Eight participants were treated utilizing ultrasound technology, one was treated using pulsed electromagnetic fields and one was treated with combined magnetic fields. There was a high level of significance for nine of the eleven statistical tests which were performed on three independent scales for ultrasound. The participants who were treated using pulsed electromagnetic fields and combined magnetic fields experienced greater than 80% improvement for the comprehensive scores on all three measurement scales. Conclusion: This was the first clinical use of bone growth stimulators for OA of the knee. All three technologies of ultrasound, pulsed electromagnetic fields, and combined magnetic fields were shown to be effective. The initial results are encouraging and directions for future research are discussed. Osteoarthritis (OA) is the most common type of arthritis found in the United States . The knee joint is the most frequently affected joint with estimates of 37% of adults over 60 years of age having radiographic evidence of knee OA and 12% having symptoms related to knee OA accompanying radiographic findings . The incidence and prevalence of this debilitating disease combined with lack of effectiveness of conservative treatment has led to estimates that over half of the adults in the U.S. diagnosed with knee osteoarthritis will undergo a total knee replacement . These facts provide the basis for a need for innovative and effective treatments. Despite the high prevalence and economic burden the pathophysiology of osteoarthritis of the knee is incompletely understood [4- 6]. The emerging understanding is that osteoarthritis of the knee is primarily a disease of subchondral bone and that the hyaline cartilage changes are secondary . This has led to discussions concerning the reliance of cartilage in osteoarthritis on subchondral bone health, and the description of subchondral bone and cartilage disease as a rediscovered functional unit [8,9]. This understanding has led to the establishment of subchondral bone as a key target for osteoarthritis treatment . The reasoning for treatment of subchondral bone for osteoarthritis of the knee is based upon the importance of both the shock-absorbing and nutrient delivery properties of subchondral trabecular bone . The shock absorbing properties is a result of the microarchitecture of trabecular orientation which is uniquely adapted to the mechanical forces imposed across the joint . In disease states such as OA of the knee the subchondral bone becomes stiffened and with alterations of this shock absorbing property, increased forces are transmitted to the articular cartilage which leads to a cascade of events of inflammation and ultimately cartilage loss. This reasoning is based on observed variations in the trabecular microstructure in knee OA which affects the biomechanical competence of bone [12,13]. The scenario of this pathophysiology indicates that OA of the knee is primarily a disease of subchondral bone and the joint changes are secondary. The nutritional contribution of the health of subchondral bone to deliver nutrients to the hyaline cartilage is also a critical aspect of the disease process. There is evidence for direct signaling between subchondral bone and articular cartilage with both mechanical and biochemical interactions . Under physiologic conditions the maintenance of the health and nutrition of the joint is dependent upon articular loading and unloading of the cartilage and subchondral regions . This creates mechanical forces which affect fluid dynamics. This aspect of fluid dynamics is critical to nutrient delivery and has led to considerations of a vascular contribution to the pathophysiology of osteoarthritis of the knee which has now been confirmed [15,16]. The condition of venous stasis contributes to the disease process because the required bone fluid pressure gradients and sheer stresses associated with nutrient delivery are adversely impacted in the condition of venous stasis which leads to bone adaptation . This vascular link has been further confirmed with imaging studies which have identified bone marrow edema patterns associated with advanced knee OA and also correlate bone marrow edema with clinical progression of knee osteoarthritis [18-20]. Subsequent research has led to the term bone marrow lesions (BML’s) for these MRI imaging patterns of bone marrow edema observed in OA of the knee . These MRI patterns have also been correlated with histologic findings and fibrosis has been observed to be a predominant finding [22,23]. Refinement of MRI settings has recently identified significantly greater edema, fibrosis and necrosis present in BML’s found in OA of the knee . Clinically, these changes in BML’s have been associated with fluctuations in knee pain in the MOST study such that diminishing size of BML’s was associated with resolution of knee pain . This has led to the suggestion that BML’s may provide a target for interventions in knee OA and for monitoring progression [26- 28]. This is particularly promising since these MRI patterns are observed prior to radiographic evidence of OA of the knee . There is also evidence that for all cases where bone marrow edema pattern is observed on MRI there is subchondral ingrowth of fibrovascular tissue and increased bone remodeling . This is consistent with the evidence of Type II collagen degradation which is also associated with BML’s in OA of the knee . This correlation of MRI findings with clinical symptom severity has led to the WORMS scoring as a semi-quantitative scoring method . These findings lead to the subchondral bone as an interesting target for therapeutic interventions in OA of the knee . This reasoning is derived from an understanding of the events which lead to trabecular bone stiffness and ultimately with cartilage loss from excessive transferred forces [11,34]. Bone remodeling is an inherent aspect of this pathophysiology, because normal bone remodeling is a complex process where the biomechanical forces on bone are sensed by the osteocyte synctium within the canalicular network which then coordinates osteoclast and osteoblast function with resultant implications expressed within the extracellular matrix and matrix mineralization . In OA of the knee it is established that there exists abnormal subchondral bone remodeling . This pathological remodeling of human trabecular bone has been studied at the level of the basic multicellular unit and the mechanisms of the coupling of bone resorption and bone formation have been discussed . The basic multicellular unit involved with bone remodeling has been determined to include the structure of a bone remodeling compartment . This bone remodeling compartment is known to direct the coupling process which depends upon local signals, and is intimately involved with a circulatory function of bone lining cells . This additional vascular role in the pathophysiology of OA of the knee associated with the mechanism of coupling has been confirmed . The sequence of events places venous congestion early in the disease process leading to fibrosis with subsequent stiffening of the subchondral bone. This then leads to the escalation of forces transmitted to the hyaline cartilage with the associated inflammatory cascade leading to the hallmark radiographic feature of joint space narrowing. The emerging picture of this pathophysiology provides compelling evidence that OA of the knee is primarily a disease of subchondral bone and that the cartilage changes are secondary . If this is true, there are currently a number of treatments that are considered to be the state of the art, such as injections of steroids, hyaluronic, and platelet rich plasma that are actually directed to the symptoms related to the cartilage deterioration and not the source of the problem which is the health of the subchondral bone . Surprisingly, there are currently no treatments for OA of the knee directed to the health of subchondral bone . It is therefore innovative to consider new treatment modalities for this purpose. Interestingly, OA of the knee can be considered to be a result of a cascade of events with venous congestion leading to fibrosis leading to subchondral stiffening leading to joint space inflammation and deterioration. In this scenario treatments that can alleviate venous congestion and fibrosis would be expected to result in improvement in the course and symptoms of OA of the knee. For this reason bone growth stimulators are an intriguing investigational modality. Bone growth stimulators are treatments that provide for bone remodeling in the condition of bone fracture non-union. These non-invasive devices are capable of changing the fibrous tissue of the callus associated with fracture non-union into histologically normal bone. It is hypothesized that these devices can also induce bone remodeling in the condition of OA of the knee such that the venous congestion and fibrosis can also be treated through the process of bone remodeling with the result of normalization of subchondral bone health. There are currently four modalities of bone growth stimulators that are approved by the FDA for this purpose. These are Pulsed Electromagnetic Fields (PEMF’s), Capacitively Coupled Electric Fields, Direct Current, and Ultrasound (US). Of these technologies, both PEMF’s and US have been used in the condition of OA of the knee, but neither technology has been directed to subchondral bone. PEMF’s have been shown to have effects on both bone and cartilage, and the technical aspects of the signaling are distinct. All of the previous studies of OA of the knee using PEMF’s have been directed to treating the cartilage, and none have been directed to treating the bone [44-47]. Similarly, the signaling characteristics are distinct if the US is directed to treating soft tissue or bone . This distinction is a regulatory issue where therapeutic US is an FDA Class II device and US directed to bone growth stimulation is an FDA Class III device . All of the previous studies of OA of the knee using US have been directed to treating soft tissues, and none have been directed to treating subchondral bone [50,51]. The US treatment of bone regeneration and the utility for fracture non-union has been extensively studied [52,53]. Low Intensity Pulsed Ultrasound (LIPUS) has confirmed beneficial bio effects on tissue regeneration. However, the biological response to LIPUS is exceedingly complex and involves numerous cell types with signaling and activates several pathways. These mechano-transduction pathways involved in cell responses include MAPK and other kinases signaling pathways, gap-junctional intercellular communication, up-regulation and clustering of integrin, involvement of the COX-2/PGE2 and iNOS/NO pathways, and activation of the ATI mechanoreceptor . The practical application of these various technologies for OA of the knee is based upon the commonality of fibrous tissue which is present in both the callus of fracture non-union and in the subchondral bone of OA of the knee. This creates the potential for a treatment of OA of the knee with bone growth stimulators. Since bone growth stimulators are able to change fibrous tissue into normal bone through the process of bone remodeling, it is conceivable that bone growth stimulators can remodel the diseased subchondral bone in OA of the knee with venous congestion and fibrosis to improve biomechanical properties and alleviate symptoms. The aim of the present study was to utilize validated and reliable clinical assessment tools to determine if there is a benefit for the use of Bone Growth Stimulators for osteoarthritis of the knee. Patient consent was obtained for the off label use of bone growth stimulators for the treatment of osteoarthritis of the knee. Ten patients with confirmed osteoarthritis of the knee were included in this pilot study. Eight patients used ultrasound technology for bone growth stimulation, one patient used combined magnetic field technology for bone growth stimulation, and one patient used pulsed electromagnetic fields technology for bone growth stimulation. Each patient’s pain and quality of life were assessed on three independent scales before and after treatment with non-invasive bone growth stimulators utilizing ultrasound technology. Clinical assessments were made at the start of the study, and at completion of treatment. Duration of treatment was between 3 and 4 months at 20 min per day. Ultrasound frequency specifications were 1.5 ± 5% MHz Modulating signal burst width 200 ± 10% microsecond (μs), Repetition Rate 1.0 ± 10% kilohertz (kHz), Duty Factor 20%, Temporal average power 117 ± 30% milliwatts (mW), Spatial avg.-temporal avg. (SATA) 30 ± 30% mW/cm2, Beam nonuniformity ratio (BNR) 4.0 maximum, and collimated beam type. Patients used the device for 20 min daily . Pulsed electromagnetic fields were generated by a control unit powered by a 9 V direct current power source. The magnetic field waveform consists of bursts of triangular (saw-tooth) pulses having a pulse frequency of 3.8 kHz, burst duration of 5.56 ms, and a burst on-off period of 67 ms. The resulting burst on-off frequency is 1.5 Hz. The maximum amplitude of the magnetic field was approximately 2 mT (20 G) . Combined magnetic fields were utilized such that when the specified current is applied to the coil, it generates an extremely low-frequency and extremely low-intensity magnetic field that has both alternating and direct current (AC and DC) components, labeled a combined magnetic field (CMF). Specifically, the field oscillates sinusoidally at a frequency of 76.6 Hertz with an AC component of 40.0 ± 8.0 μT, peak to peak, and a DC component of 20.0 ± 2.0 μT and is calibrated at a distance of 0.10 m normal to the projected plane of the coil. The tolerances for the AC and DC fields are applied to the component of the MFD, Bz, normal to the plane of the coil. It is important to note that specifications based on these tolerances (AC: 32.0–48.0 μT, DC: 18.0–22.0 μT) are not the same as the limits of the therapeutic field, which are currently unknown . All patients had radiologically confirmed osteoarthritis of the knee. Patients were excluded from the study if they had received intra-articular injections in the joint and/ or attended physiotherapy sessions for the affected knee, within the 6 months prior to the study. Patients were also excluded if they had a known or suspected joint infection or a specific condition (neoplasm, diabetes mellitus, paresis, osteonecrosis, or recent trauma) or poor general health status that would interfere with the functional assessments during the study. The use of NSAIDs was not permitted during the study period; any pre-treatment with NSAIDs had to be discontinued 15 days before the start of the study. The efficacy criterion utilized the validated and reliable clinical assessment tools of the WOMAC scores, RAND health survey, and Lequesne Index [57,58]. These included WOMAC scores for joint pain (WP), joint stiffness (WS), physical function (WF), and total (WC). The RAND Short Form 36 (SF- 36) health survey questionnaire was utilized to generate the Rand quality of life score (RQ), Rand pain score (RP), and Rand composite score (RC). The Lequesne Index include pain (LP), distance (LD), functioning with activities of daily living (LF), and composite Lequesne score (LC). SPSS Statistics was utilized to generate paired t-tests for the 11 measurements. Paired samples correlations produced correlation and significance values, and paired samples tests produced mean, standard deviation, standard error mean, 95% confidence intervals, t-values, degrees of freedom, and significance (2-tailed). The p-value was truncated at 3 decimal points. All participants completed the trial. There were no adverse events. For the eight participants who were treated with ultrasound technology, nine of the eleven statistical tests which were performed on the three scales of WOMAC, Rand and Lequesne were highly significant as seen in Figure 1 and Table 1. Figure 1. 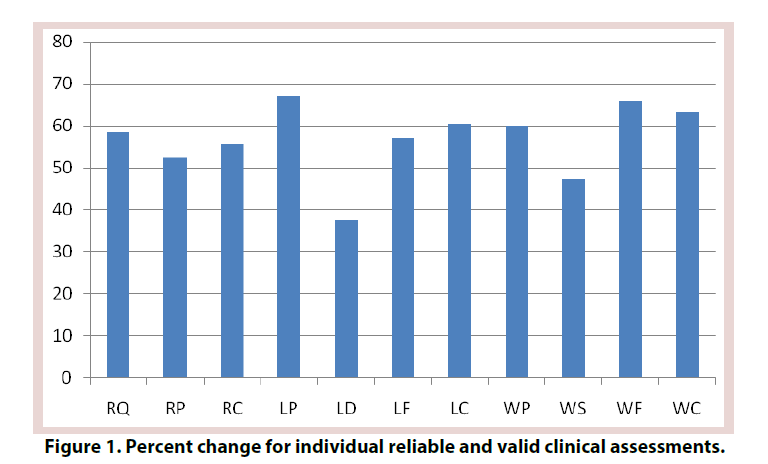 Percent change for individual reliable and valid clinical assessments. Table 1. Paired t-test with N=8 and 7 degrees of freedom for ultrasound treatment on 11 scales. For the participant treated with pulsed electromagnetic fields the percentage improvement for the individual tests were, RQ 92.3%, RP 84.6%, RC 88.5%, LP 85.7%, LD 100%, LF 100%, LC 92.3%, WP 88.8%, WS 80%, WF 88.2%, and WC 87.3 %. For the participant treated with combined magnetic fields the percentage improvement for the individual tests were, RQ 93.7%, RP 69.2%, RC 81.5%, LP 100%, LD 100%, LF 50%, LC 94.1%, WP 75.0%, WS 100%, WF 83.3%, and WC 83.3%. It has been established that changes in subchondral bone are intrinsic to the diagnosis of OA of the knee . It has also been established that these changes occur prior to degradation of the articular cartilage, indicating that it plays a role in the pathogenesis of osteoarthritis . There has been long standing presumptive evidence of this etiology from imaging studies, and more recently confirmation from biomarkers of subchondral bone turnover which has been shown to predict progression of joint space narrowing and osteophytes in osteoarthritis . Based on this understanding of the pathogenesis of osteoarthritis of the knee it is reasonable to consider treating the subchondral bone to improve pain and functioning in this disease state. The micro-architecture of subchondral bone shares commonality with bone fracture non-union the presence of fibrous tissue. It is hypothesized that this fibrosis in the trabecular bone in the subchondral regions in osteoarthritis of the knee contributes to altered biomechanics that result in transmission of forces to the articular cartilage and is a primary event in a cascade of events culminating in the constellation of molecular, biochemical and structural changes that create the progression of osteoarthritis of the knee. A further consideration is that the fibrosis is a result of venous congestion in the subchondral bone. The condition of venous congestion in OA of the knee is clearly established with imaging studies, and seen clinically as the symptom of stiffness and the quality of a deep ache with the first few steps of affected patients following prolonged sitting that quickly alleviates with walking as the transmitted forces help to dissipate the venous engorgement. Venous congestion leading to fibrosis is known to occur in a variety of conditions. For instance, progressive fibrosis of the skin and subcutaneous tissues induced by chronic venous hypertension is referred to as lipodermatosclerosis . Chronic passive hepatic congestion (congestive hepatopathy) also leads to hepatic fibrosis . Fibrosis is also found in pelvic congestion syndrome . Myocardial fibrosis and hypertrophic cardiomyopathy are also linked to venous congestion and hypoperfusion . There is evidence of venous congestion and microvascular dysfunction in cystic fibrosis . Pulmonary fibrosis is also thought to result from venous congestion . Passive hyperemia of the spleen has also resulted in idiopathic portal hypertension due to fibrosis of the liver in the absence of cirrhosis . Based on the correlation of venous congestion and fibrosis in the heart, lung, liver, kidney, spleen, skin, and uterus, as well as in cystic fibrosis, this same pathophysiology would be expected to be present in OA of the knee. The correlation with venous stasis has been identified as early as the 1960’s and at that time was called ‘congestive pain’ in patients with OA of the knee and treated with osteotomy . The effect of venous stasis with the cascade of events to include increased intraosseous pressure, decreased arteriovenous pressure difference, leading to malnutrition of the bone and disease progression was also suggested in the 1960’s . This concept endured through the 1970’s with this sequence described as an increase of resistance to venous flow with venous congestion in cancellous bone marrow leading to deterioration of nutritive capillary blood flow. The time course was also noted to be long and gradual from identification of these changes to subsequently observed secondary structural damage in OA of the knee and eventually to the clinical evaluation of pain . Also in the 1970’s this was described as intraosseous engorgement-pain syndrome . Subsequent studies of intraosseous phlebography with intraosseous pressure measurements and scintigraphy confirmed venous congestion and stasis with increased intraosseous pressure. These identical findings with all three methods of investigation in patients with the intraosseous engorgement-pain syndrome and osteoarthritis suggest a common pathomechanism . Significantly and more recently is the discovery of a correlation of venous stasis and intraosseous pressure with the radiographic stage of OA of the knee. The higher the intraosseous pressure, the more advanced the stage . This is also consistent with associated studies which have identified erythema and capillary hyperaemia as associated with synovial fibrosis in Behçet disease of the knee . The common pathomechanism which links venous congestion, intraosseous hypertension and disease progression of OA of the knee is now known to be the presence of fibrosis. This is supported by the identification of subchondral venous congestion with fibrosis in experimental models of OA of the knee [75,76]. It is therefore intriguing to consider bone growth stimulators as an innovative treatment for OA of the knee. This concept is fundamentally based on the knowledge that the changes observed in subchondral bone precede the changes observed in the cartilage . The rationale for this treatment also logically follows from the facts of these discussions of the cascade of events that lead to OA of the knee. Finally, the commonality of the presence of fibrosis in the subchondral region of the bone in OA of the knee and in the callus of fracture non-union, combined with the evidence that bone growth stimulators are able to produce bone remodeling through the mechanism of histologically changing fibrous tissue into a continuum of normal bone, presents an opportunity to evaluate the effects of the use of bone growth stimulators in OA of the knee. It is hypothesized that remodeling of the subchondral bone in OA of the knee results in decreased venous congestion, decreased intraosseous pressure, decreased fibrosis, improved capillary flow, improved nutrition, and decreased pain. It is further hypothesized that since bone growth stimulators use a variety of signal patterns to achieve the same outcome in treatment of fracture non-union, the various specific technologies utilized for bone growth stimulations would all be expected to achieve similar results for use in OA of the knee. This report is the first clinical use of bone growth stimulators for OA of the knee. These results are highly encouraging. It is remarkable to obtain such a high level of statistical significance with such a small sample size. Limitations of the current study and confounding variables include small sample size, lack or stratification of initial severity at initiation of treatment, and a range of treatment duration. There are many directions for future study that can be investigated. These include larger sample sizes, more rigorous inclusion of the various technologies of bone growth stimulators, imaging correlation, concurrent biomarker measurements, and mechanistic studies. Robert A Wilson Ph.D., Professor Emeritus, Marshall University performed the statistical analysis. Kenneth L Willeford, MD of Coastal Carolinas Integrated Medicine in Supply, NC participated in all aspects of the study in coordination with the authors. The authors disclose familial relationship with owner of US Patent # 8,972,019 Method and device for treating osteoarthritis noninvasively. Lawrence RC, Felson DT, Helmick CG et al. National arthritis data workgroup. Estimates of the prevalence of arthritis and other rheumatic conditions in the United States, Part II. Arthritis. Rheum. 58(1), 26–35 (2008). Dillon CF, Rasch EK, Gu Q et al. Prevalence of knee osteoarthritis in the United States: arthritis data from the Third National Health and Nutrition Examination Survey 1991–94. J. Rheumatol. 33(11), 2271–2279 (2006). Weinstein AM, Rome BN, Reichmann WM et al. Estimating the burden of total knee replacement in the United States. J. Bone. Joint. Surg. Am. 95(5), 385–392 (2013). Bastick AN, Runhaar J, Belo JN et al. Prognostic factors for progression of clinical osteoarthritis of the knee: a systematic review of observational studies. Arthritis. Res. Ther. 17, 152 (2015). Moyer RF, Ratneswaran A, Beier F et al. Osteoarthritis year in review 2014: mechanic–basic and clinical studies in osteoarthritis. Osteoarthritis. Carligale. 22(12), 1989–2002 (2015). Andriacchi TP, Favre J. The nature of in vivo mechanical signals that influence cartilage health and progression to knee osteoarthritis. Curr. Rheumatol. Rep. (11), 463 (2015). Imhof H, Breitenseher M, Kainberger F et al. Importance of subchondral bone to articular cartilage in health and disease. Top. Magn. Reson. Imaging. (3), 180–192 (1999). Felson DT, Neogi T. Osteoarthritis: is it a disease of cartilage or of bone? Arthritis. Rheum. 50(2), 341–344 (2004). Imhof H, Sulzbacher I, Grampp S et al. Subchondral bone and cartilage disease: a rediscovered functional unit. Invest. Radiol. 10, 581–588 (2000). Castañeda S, Roman–Blas JA, Largo R et al. Subchondral bone as a key target for osteoarthritis treatment. Biochem. Pharmacol. 83(3), 315–323 (2012). Li G, Yin J, Gao J et al. Subchondral bone in osteoarthritis: insight into risk factors and microstructural changes. Arthritis. Res. Ther. 5(6), 223 (2013). Kamibayashi L, Wyss UP, Cooke TD et al. Trabecular microstructure in the medial condyle of the proximal tibia of patients with knee osteoarthritis. Bone. 17(1), 27–35 (1995). Patel V, Issever AS, Burghardt A et al. MicroCT evaluation of normal and osteoarthritic bone structure in human knee specimens. J. Orthop. Res. 1, 6–13 (2003). Pan J, Zhou X, Li W et al. In situ measurement of transport between subchondral bone and articular cartilage. J. Orthop. Res. 27(10), 1347–1352 (2009). Imhof H, Breitenseher M, Kainberger F et al. Degenerative joint disease: cartilage or vascular disease? Skeletal. Radiol. 7, 398–403 (1997). Findlay DM. Vascular pathology and osteoarthritis. Rheumatol. 46(12), 1763–1768 (2007). Wang L, Fritton SP, Weinbaum S et al. On bone adaptation due to venous stasis. J Biomech. 36(10), 1439–1451 (2003). Link TM, Steinbach LS, Ghosh S et al. Osteoarthritis: MR imaging findings in different stages of disease and correlation with clinical findings. Radiol. 226(2), 373–281 (2003). Kijowski R, Stanton P, Fine J et al. Subchondral bone marrow edema in patients with degeneration of the articular cartilage of the knee joint. Radiol. 238(3), 943–949 (2006). Felson DT, McLaughlin S, Goggins J et al. Bone marrow edema and its relation to progression of knee osteoarthritis. Ann. Intern. Med. 139, 330–336 (2013). Xu L, Hayashi D, Roemer FW et al. Magnetic resonance imaging of subchondral bone marrow lesions in association with osteoarthritis. Seminars. Arthritis. Rheumatol. 42(2), 105–118 (2012). Zanetti M, Bruder E, Romero J et al. Bone Marrow Edema pattern in osteoarthritic knees: correlation between MR Imaging and histologic findings. Radiol. 215(3), 835–840 (2000). Bergman AG, Willén HK, Lindstrand AL et al. Osteoarthritis of the knee: correlation of subchondral MR signal abnormalities with histopathologic and radiographic features. Skeletal. Radiol. 23(6), 445–448 (1994). Muratovic D, Cicuttini F, Wluka A et al. Bone marrow lesions detected by specific combination of MRI sequences are associated with severity of osteochondral degeneration. Arthritis. Res. Ther. 18, 54 (2016). Zhang Y, Nevitt M, Niu J et al. Fluctuation of knee pain and changes in bone marrow lesions, effusions and synovitis on MRI: The MOST Study. Arthritis. Rheumatism. 63(3) (2011). Davies–Tuck ML, Wluka AE, Wang Y et al. The natural history of bone marrow lesions in community–based adults with no clinical knee osteoarthritis. Ann Rheum Dis. 68(6), 904–908 (2009). Lowitz T, Museyko O, Bousson V, et al. Bone marrow lesions identified by MRI in knee osteoarthritis are associated with locally increased bone mineral density measured by QCT. Osteoarthritis. Cartilage. 21(7), 957–964 (2013). Driban JB, Price LL, Lo GH et al. Evaluation of bone marrow lesion volume as a knee osteoarthritis biomarker – longitudinal relationships with pain and structural changes: data from the Osteoarthritis Initiative. Arthritis. Res.Ther. 15(5), R112 (2013). Roemer FW, Kwoh CK, Hannon M J et al. What comes first? : Multi–tissue involvement leading to radiographic osteoarthritis: MRI–based trajectory analysis over 4 years in the Osteoarthritis Initiative. Arthritis. Rheumatol. 67(8), 2085–2096 (2015). Saadat E, Jobke B, Chu B et al. Diagnostic performance of in vivo 3–T MRI for articular cartilage abnormalities in human osteoarthritic knees using histology as standard of reference. European. Radiol. 18(10), 2292–2302 (2008). Garnero P, Peterfy C, Zaim S et al. Bone marrow abnormalities on magnetic resonance imaging are associated with type II collagen degradation in knee osteoarthritis: A three–month longitudinal study. Arthritis. Rheumatism. 52, 2822–2829 (2005). Peterfy CG, Guermazi A, Zaim S et al. Whole–Organ Magnetic Resonance Imaging Score (WORMS) of the knee in osteoarthritis. Osteoarthritis. Cartilage. 12(3), 177–1790 (2004). Madry H, van Dijk CN, Mueller–Gerbl M. The basic science of the subchondral bone. Knee. Surg. Sports. Traumatol. Arthrosc. 18(4), 419–433 (2010). Felson DT. An update on the pathogenesis and epidemiology of osteoarthritis. Radiol. Clin. North. Am. 42(1), 1–9 (2004). Clarke B. Normal bone anatomy and physiology. Clin. J. Am. Soc. Nephrol. 3(Suppl 3), S131–S139 (2008). Lajeunesse D, Reboul P. Subchondral bone in osteoarthritis: a biologic link with articular cartilage leading to abnormal remodeling. Curr. Opin. Rheumatol. 15(5), 628–633 (2003). Eriksen EF. Normal and pathological remodeling of human trabecular bone: three dimensional reconstruction of theremodeling sequence in normals and in metabolic bone disease. Endocr. Rev. 7(4), 379–408 (1986). Hauge EM, Qvesel D, Eriksen EF et al. Cancellous bone remodeling occurs in specialized compartments lined by cells expressing osteoblastic markers. J. Bone. Miner. Res. 16(9), 1575–1582 (2001). Parfitt AM. The bone remodeling compartment: a circulatory function for bone lining cells. J Bone Miner Res. 16(9), 1583–1585 (2001). Parfitt AM. The mechanism of coupling: a role for the vasculature. Bone. 26(4), 319–323 (2000). Kwan Tat S, Lajeunesse D, Pelletier JP et al. Targeting subchondral bone for treating osteoarthritis: what is the evidence? Best Pract. Res. Clin. Rheumatol. 24(1), 51–70 (2010). Fibel KH, Hillstrom HJ, Halpern BC. State–of–the–Art management of knee osteoarthritis. World J. Clin. Cases. 3(2), 89–101 (2015). Sharma L. Osteoarthritis year in review 2015: clinical. Osteoarthritis Cartilage. 24(1), 36–48 (2016). Bagnato GL, Miceli G, Marino N et al. Pulsed electromagnetic fields in knee osteoarthritis: a double blind, placebo–controlled, randomized clinical trial. Rheumatol. 55(4), 755–762 (2016). Trock DH, Bollet AJ, Dyer RH et al. A double–blind trial of the clinical effects of pulsed electromagnetic fields in osteoarthritis. J Rheumatol. 20(3), 456–460 (1993). Thamsborg G, Florescu A, Oturai P et al. Treatment of knee osteoarthritis with pulsed electromagnetic fields: a randomized, double–blind, placebo–controlled study. Osteoarthritis Cartilage. 13(7), 575–581(2005). Pipitone N, Scott DL. Magnetic pulse treatment for knee osteoarthritis: a randomised, double–blind, placebo–controlled study. Curr. Med. Res. Opin. 17(3), 190–196 (2001). Miller D, Smith N, Bailey M et al. Overview of therapeutic ultrasound applications and safety considerations. American. Inst. Ultrasound. Medi. 31(4), 623–634 (2012). Code of Federal Regulations Title 21– Food and Drugs. Chapter I– Food and drug administration department of Health and Human Services, Subchapter H– Medical devices, Part 890– Physical Medicine Devices, Subpart F–Physical Medicine Therapeutic Devices. Section 890, 5860– Ultrasound and muscle stimulator (2016). Speed CA. Therapeutic ultrasound in soft tissue lesions. Rheumatol. 40(12), 1331–1336 (2001). Zhang C, Xie Y, Luo X et al. Effects of therapeutic ultrasound on pain, physical functions and safety outcomes in patients with knee osteoarthritis: A systematic review and meta–analysis. Clin. Rehabil. 30(10), 960–971 (2016). Claes L, Willie B. The enhancement of bone regeneration by ultrasound. Prog. Biophys. Mol. Biol. 93(1–3), 384–398 (2007). Padilla F, Puts R, Vico L et al. Stimulation of bone repair with ultrasound. Adv. Exp. Med. Biol. 880, 385–427 (2016). Biglari B, Yildirim TM, Swing T et al. Failed treatment of long bone non–union with low intensity pulsed ultrasound. Archives. Orthop. Trauma. Sur. 136, 1121–1134 (2016). Midura RJ, Ibiwoye MO, Powell KA et al. Pulsed electromagnetic field treatments enhance the healing of fibular osteotomies. J. Orthop. Res. 23, 1035–1046 (2005). Stippick TW, Sheller MR. Combined magnetic fields provide robust coverage for interbody and posterolateral lumbar spinal fusion sites. Med. Biol. Engg. Comput. 54, 113–122 (2016). Collins NJ, Misra D, Felson DT et al. Measures of Knee Function: International Knee Documentation Committee (IKDC) Subjective Knee Evaluation Form, Knee Injury and Osteoarthritis Outcome Score (KOOS), Knee Injury and Osteoarthritis Outcome Score Physical Function Short Form (KOOS–PS), Knee Outcome Survey Activities of Daily Living Scale (KOS–ADL), Lysholm Knee Scoring Scale, Oxford Knee Score (OKS), Western Ontario and McMaster Universities Osteoarthritis Index (WOMAC), Activity Rating Scale (ARS), and Tegner Activity Score (TAS). Arthritis. Care. Res. 63(011), S208–S228 (2011). Lequesne MG, Mery C, Samson M et al. Indexes of severity for osteoarthritis of the hip and knee. Validation—value in comparison with other assessment tests. Scand. J. Rheumatol. Suppl. 65, 85–89 (1987). Huebner JL, Bay–Jensen AC, Huffman KM et al. ALPHA–CTX is associated with subchondral bone turnover and predicts progression of joint space narrowing and osteophytes in osteoarthritis. Arthritis. Rheumatol. 66(9), 2440–2449 (2014). Bailey AJ, Mansell JP, Sims TJ, Banse X. Biochemical and mechanical properties of subchondral bone in osteoarthritis. Biorheology. 41(3–4):349–358 (2004). Nicholls SC. Sequelae of untreated venous insufficiency. Seminars. Interventional. Radiol. 22(3), 162–168 (2005). Simonetto DA, Yang H, Yin M et al. Chronic passive venous congestion drives hepatic fibrogenesis via sinusoidal thrombosis and mechanical forces. Hepatology. 61(2), 648–659 (2015). Durham JD, Machan L. Pelvic congestion syndrome. Seminars. Interventional. Radiol. 30(4), 372–380 (2013). Petersen SE, Jerosch–Herold M, Hudsmith LE et al. Evidence for microvascular dysfunction in hypertrophic cardiomyopathy: new insights from multiparametric magnetic resonance imaging. Circulation. 115(18), 2418–2425 (2007). Rodriguez–Miguelez P, Thomas J, Seigler N et al. Evidence of microvascular dysfunction in patients with cystic fibrosis. Am. J. Physiol. Heart. Circ. Physiol. 310(11), H1479–H1485 (2016). Sudo N, Nambu A, Yamakawa T et al. Pulmonary focal fibrosis associated with microscopic arterio–venous fistula manifesting as focal ground–glass opacity on thin–section CT. BMC Pulmonary. Med. 13(3), 1–4 (2013). Ziarkiewicz–Wróblewska B, Górnicka B, Wróblewski T et al. Idiopathic portal hypertension: a case report. Med. Sci. Monit. 10(11), CS69–72 (2004). Helal B. The pain in primary osteoarthritis of the knee. Its causes and treatment by osteotomy. Postgrad. Med. J. 41(474), 172–181 (1965). Brookes M, Helal B. Primary osteoarthritis, venous engortement and osteogenesis. J. Bone. Joint. Surg. Br. 50(3), 493–504 (1968). Arnoldi CC, Lemperg K, Linderholm H. Intraosseous hypertension and pain in the knee. J. Bone. Joint. Surg. Br. 57(3), 360–363 (1975). Lemperg RK, Arnoldi CC. The significance of intraosseous pressure in normal and diseased states with special reference to the intraosseous engorgement–pain syndrome. Clin. Orthop. Relat. Res. (136), 143–156 (1978). Arnoldi CC, Djurhuus JC, Heerfordt J et al. Intraosseous phlebography, intraosseous pressure measurements and 99mTC–polyphosphate scintigraphy in patients with various painful conditions in the hip and knee. Acta. Orthop. Scand. 51(1), 19–28 (1980). Uchio Y, Ochi M, Adachi N et al. Intraosseous hypertension and venous congestion in osteonecrosis of the knee. Clin. Orthop. Relat. Res. 384, 217–223 (2001). Moll C, Bogas M, Gómez–Puerta JA et al. Macroscopic features of knee synovitis in early untreated Behçet disease and psoriatic arthritis. Clin. Rheumatol. 28(9), 1053–1057 (2009). Kofoed H. Hemodynamics and metabolism in arthrosis. Studies in the rabbit knee. Acta. Orthop. Scand. 57(2), 119–122 (1986). Willeford B. Orthostatic hypotension in the anesthetized rabbit in the sitting position exceeds cerebral autoregulation. J. Basic. Clin. Physiol. Pharmacol. 23(1), 11–15 (2011). Radin EL, Martin RB, Burr DB et al. Effects of mechanical loading on the tissues of the rabbit knee. J. Orthop. Res. 2(3), 221–234 (1984).